PSA: Give Rand Paul a Pass on Cruz Attacks | Virginia Right! 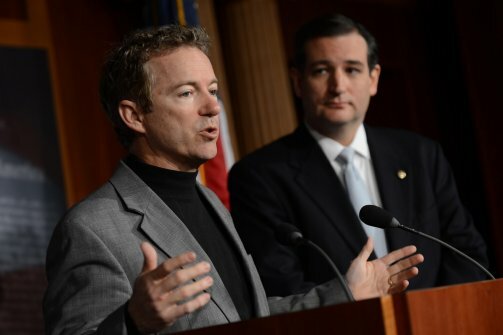 Much ado has been made throughout the day about Rand Paul going after Ted Cruz. Ted Cruz supporters are understandably upset and disappointed. However, we really ought to stay focused on the nature of primaries and understand that for Rand Paul to win the nomination, he has to beat Ted Cruz. Where do you think all this birther nonsense is coming? It’s coming from the Paul Campaign. Most of the anti-Cruz talking points I’ve heard over the last few weeks are coming out of the Paul Campaign. So what? It’s a campaign. Rand Paul wants to be President as much as anyone else running for the highest office in the land. He’s paying a staff to help get him elected. They have got to be telling him that if he wants to win the nomination, he’s got to put some distance between himself and Cruz and he’s got to pry a great deal of Cruz supporters away and claim them as his own. That’s the nature of a campaign. Rand Paul hasn’t abandoned the cause, hasn’t become a political hack, or anything nefarious of the kind. In elections, our candidates and ourselves must have thick skin. We must be able to accept that our friends will try to beat us. That’s just the nature of the beast. I just listened to Mark Levin rail against Rand Paul as if Paul had become the devil. He hasn’t. My request of Ted Cruz supporters is simple: take the high road. Let Rand Paul run his campaign as he sees fit. Paul is simply trying to demonstrate the difference between himself and Ted Cruz. Ted Cruz has on numerous occasions gone after Mitch McConnell by name. 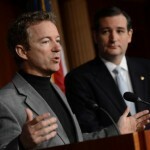 Rand Paul is very close to Mitch McConnell, he supported him in his campaign, and he doesn’t have to stay silent when Cruz goes after the Senior Senator from Paul’s own state. Paul is merely making it clear where he stands and how he differs from Cruz. Let him make these distinctions without feeling the need to get defensive. It’s an election. Give Paul a pass. It’s supposed to be a free country. People can say what they want. Let the chips fall wherever. You’re right. It’s each candidate for him/herself. I’m so over everyone forcing fake apologies. A fake apology is a farce. After all, this is politics. It’s not for the faint of heart. I say let ’em all go great guns and see who’s still standing. Steel sharpens steel. Thick skin aside Rand Paul is falling like a ton of bricks dropped off the Trunp Towers ! He has very little substance on key issues and seems to only criticize other candidates positions. I believe Mitch Mcconnell lied to Ted Cruz and we need more representatives to call a spade a spade. Untruthful politicians are not rare but a peer calling out another politicians lie is rare and more and more voters are realizing prevarication is the norm and turning against them. I’ll bet Rand couldn’t come close in helping get McConnell re-elected in today’s political climate and Cruz’s telling it like it happened would be a big influence in him not being elected again. Really, you disappoint me. I think you have stated you lean toward the libertarians and Rand Paul. By Rand’s own statement he is close to McConnell. He, McConnell is like Eric Cantor and the rest of the elites in our ruling class. Rand is disappointed with Ted’s calling McConnell a liar when in fact he is and that’s being nice. How long must we listen to these politicians lie to us and then practice the so called proper decorum. I have been skeptical of Rand but he was my 4th choice but no longer. He is just like the rest of the gang of congressional crooks. I am really disappointed in your subtly trying to give him some cover. He will have no chance to be our next president. I support Cruz. Even if Rand tries this “eat our own” thing, I don’t think we should respond in kind. That’s all I’m saying.